It’s five o’clock on a typical school day, but instead of quiet hallways and janitors cleaning up the school, booming noise can be heard from the gymnasium. That noise is the constant communication and hustle of the Rockland High varsity volleyball team. The Dogs were good this year, so good that not only did they make the state tournament, but they also made school history. First, the ladies set the tone as the first fall team to qualify for tournament and finished the season with the best record (16-2) for Rockland’s fall sports teams. In addition, Rockland earned its first ever South Shore League Championship for volleyball. Now the 2017-2018 Dogs volleyball team will forever be immortalized on the gym banners alongside their fellow teams. “After all the extra hard work and practice the team put in this offseason, it feels so rewarding to be recognized by our school and the entire South Shore League with a league championship,” said senior Jill Donahue. Coach Murphy agreed with Donohue’s comments about the girls’ efforts and accomplishments. “I gave the girls a vision, told them we need to do even better than the last season, and they came into this season with the mindset to succeed,” said Coach Murphy. Most of the time after a successful season you wonder, can they repeat in the following year with the same success? 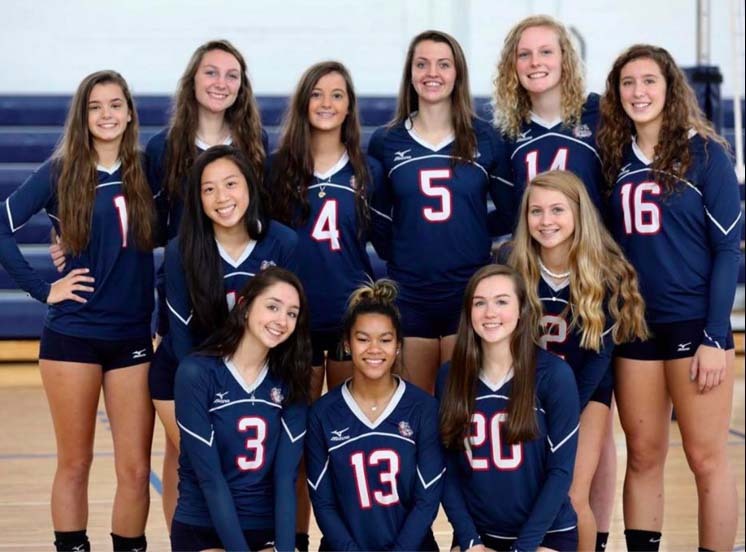 Overall, the volleyball team had the best year in school history. They ended the regular season with only two losses to division one powerhouse Hingham. Also they were able to cap off their regular season success with a tourney win against Upper Cape. Unfortunately, they lost to the defending state champions, Case, in the following quarterfinal round. Coach Murphy said, “The girls worked extremely hard this year and it was sad to see them lose.” But the coach will have fond memories of this team. “I’m extremely proud of this group,” she said. Despite the heartbreaking end to this magical season, the future looks extremely bright for Dogs’ volleyball.